The Orvillecopter by Dutch artist Bart Jansen flies in central Amsterdam, as part of the KunstRAI art festival, June 3, 2012. 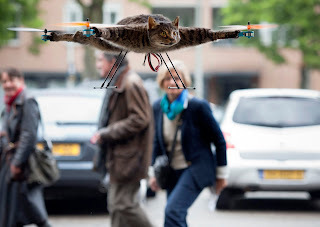 Jansen said the Orvillecopter is part of a visual art project which pays tribute to his cat Orville, by making it fly after it was killed by a car. He built the Orvillecopter together with radio control helicopter flyer Arjen Beltman. Picture taken June 3, 2012.